A 6-day adventure packed tour which will let you ski in the serene Gulmarg and also explore the gems of Srinagar while you stay on a houseboat. Private skiing sessions with an experienced instructor in the serene environs of Gulmarg. All inclusive package, taking care of your transportation, stay, food and all necessary equipment required for skiing. Stay in a houseboat while in Srinagar. Gulmarg which literally translates to ‘Meadow of Flowers’, is an extremely spectacular hill station and a popular ski resort in the district of Baramulla. Almost 60 kilometres away from the City of Srinagar, it rests in the Himalayan Valley of Pir Panjal. Discovered by Sultan Yusuf Shah, it was given a commercial value by the British during India’s Colonial Era. This place seems familiar to even those who haven’t been here, the reason? Its beautiful documentation and representation in commercial cinema.Apart from the snow-clad earth, and stunning flora travellers can also discover the World’s Highest Golf Course here. Skiing is the most popular adventure sport in Mount Apharwat and the Gulmarg Golconda is said to be one of the tallest cable car networks in the world. On the very first day, upon your arrival, you will be met by our representative at the Srinagar airport and you would be transferred to Gulmarg. Upon reaching Gulmarg you will be checking in at the hotel which will be arranged by us, you will be served a welcome drink on arrival. On the same day after lunch, you may explore the Gulmarg Skiing slopes. You will be staying overnight in the hotel. After a nice warm breakfast, you will be dropped to the Skiing Ground. Upon your arrival, you will be meeting your instructor who will explain you the beginner's lessons and help you get well accustomed to the types of equipment used in skiing. After you full day of skiing lessons, you will be dropped back to your hotel. On the 3rd and 4th day you will be following the same sequence of events as it were on Day 2. The available instructor will groom you to improve your skiing skills so that you have a firm knowledge of the basics of skiing. On the fifth day after a nice warm breakfast, you will be transferred to Srinagar. Upon your arrival, you may check in to our houseboats. After a short leisure period in the afternoon, you will be visiting the important sights of Srinagar city, the Mughal Gardens and the old part of the city will be the significant ones. On Day 6, after breakfast, you will be transferred to Srinagar airport on time to board a flight to back home. Accommodation in Gulmarg on twin sharing basis (Hotel Pine Palace/similar). Accommodation in Srinagar on twin sharing basis (Golden Apple Group of Houseboat). Ski rental charges - Ski and Ski poles for each member. Ski lessons on day-2, 3 & 4. Service of a expert ski instructor (private instructor). Pick-up and drop off at Srinagar Airport. All local transportation in a private cab. Flight or train or bus tickets. The guide and monument entrance charges. The trip is available for even solo traveller. All accommodation will be on the twin-sharing basis for couples. For a solo traveller, accommodation will be on single occupancy. The participant should be minimum 4 years of age to take part in the course. Skiing Packages depends on snowfall. The current weather forecast shows the best possibilities of Skiing specific snow in January 2019. Participants, who are below 18 years of age, will have to get the accompanying information form signed by their parents/guardians. It is recommended that 30 minutes exercise for about 10 days prior to joining the courses will be of help to tone-up the required muscles and enable the trainees to pick-up skiing quickly and efficiently. Woollen clothing, head cap and thick socks. The expected minimum temperature in Gulmarg maybe 5 to 7 degree Celsius during daytime and -4 to -10 degree Celsius below the freezing point. 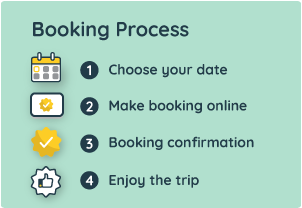 The local contact person details and phone number is shared in the booking voucher, sent to you via email after booking is made.